With some delay, here are the last two previews of Raven's Shadows. In English this time, they will get translated in French in due time. These reviews are written by no one else that the admirable Mike Hobbs, co-developper of Saga. The Kingdom of Strathclyde came into existence in the 5th Century after the departure of the Romans, and lasted until it was absorbed into Scotland in the 12th Century. During this time the kingdom which had lands in modern day Cumbria and Lower Scotland; had many names, early records show it being called Alt Clut which is linked to its then capital of Dumbarton Rock; in 870 the Vikings sacked Dumbarton and the capital was moved to Govan and after this the area became known as the kingdom of Strathclyde. The term Strathclyde Welsh may be misleading as the men of this kingdom had no real links to the Welsh kings in this period, however they shared a bond of language and were a Celtic region as opposed to an Anglo-Saxon one. So it is safe to say that the peoples of Wales and the peoples of Strathclyde would have traded with each other and formed links that way. By AD 1054 the kingdom became part of Scotland; however how and when it happened is not really known and open to a lot of debate. Sources describe how the Strathclyde warriors would fight often on horseback using the tough hill ponies that were native of the lands, they would often use hit and run tactics to attack the many enemies they faced, use of the land was key to their success in battle and they would often attack from nowhere before disappearing back into the mist of the Cumbrian hills. In Saga the Strathclyde Welsh give players a new tactic to use in their games, that being the ability of having “Off-Table” reserves. All Strathclyde Hearthguards and some of the warriors may be mounted and these mounted figures can be kept off table during the setup phase and only brought on by use of one of the Saga abilities, but more of that later. 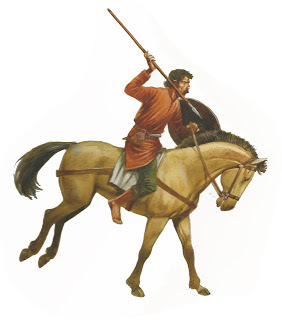 The Strathclyde are a cavalry based faction, with the Warlord and Hearthguard only available as mounted units, warriors can be mounted or unmounted and as we would expect levy are always unmounted but do have javelins to assist them in harassing the enemy. Although the Strathclyde were believed to be generally armed with javelins, historically it appears they would ride close to the enemy and use them as a close range weapon so in our games they are not deemed to be armed with javelins. It is the use of off table units that sets the Strathclyde apart from other factions as small units (no bigger the 6 figures) can be left off table during setup and brought on during the game, imagine the look on your opponents face when a unit of mounted Hearthguard suddenly appears behind him; trust me it’s great. So at this point it seems like a good idea to highlight some of the abilities the Strathclyde get. First up is the ability “Flanking Manoeuvre” which is the key ability when it come to bringing on off table units, for 2 dice you get to nominate an off table unit and a point on any table edge and the unit will move on from that point. One added benefit to this ability is it cannot be affected by some of the Activation/reaction abilities as technically the unit is not on table when activated, sorry Anglo-Danish players you can’t use intimidation against them, however you can’t move within S of any enemy unit during the move onto the table so you can’t move directly into melee. Next up is an ability called “The Doomriders” this is a melee ability which gives an extra attack and defence dice in combat, but also if you are within L of a table edge you also gain extra Attack and Defence dice for each unit you have off table, which is handy. Finally let’s have a look at an ability called “Harassment” this is another one that uses off table units to good effect. When played you designate an enemy unit that is within L of a table edge and carry out a shooting attack against them, with the number of attack dice generated depending on the number of units you have off table. The strength of the Strathclyde Welsh is not in the way they can stand and fight against opponents but the way they will force an enemy to stay in the relative safety of the center of the table, because whenever they stray out of that area the Strathclyde can attack out of nowhere. Oh one final thing to remember, if a unit is still off table when the game finishes they count against you when working out victory points so don’t leave them off table for too long eh. Right let’s finish up by looking at one of the Heroes of the Viking age for the Strathclyde Welsh Owen I, King of Strathclyde. Owen is an interesting character who formed an alliance with Olaf III of Dublin and Constantine II of Scotland against the Anglo-Saxon King Athelstan. The 2 armies met at the Battle of Brunanburh which was one of the most important battles of this period, but unfortunately for Owen that day was his last as Athelstan’s forces were victorious. If you use Owen in your force you can really confuse your opponent as Owen allows the Strathclyde player to use unmounted Hearthguards but still have access to the abilities that are normally only available to mounted ones. You may be wondering why do this when the strength of the Strathclyde Welsh is in mobility, well to be honest in some scenarios (like Homeland) having a pure mounted force can be a drawback so by using Owen you can play with an infantry based force for a change. Well that really sums up this review, the Strathclyde welsh are an interesting faction to play and some people will really dislike them, but others will love the abilities and the style of play they give you, as for me I love them; but I am biased. In AD 432, St Patrick arrived in Ireland with the task of converting the Pagan Irish to Christianity, the land he found (especially in the West) was ruled by many leaders and tribes which held influence over smaller areas. Gradually the Pagan religion died out and Christianity became the de-facto religion in the majority of the country. In the 7th century the first of the High Kings of Ireland were said to appear and these were credited with bringing a semblance of unification to the native Irish. In AD 795 the Vikings arrived and founded a settlement in what is now known as Dublin, this settlement flourished and became an important trading area as well as a base for the Vikings to launch attacks and raids against the rest of the population. In AD 1014 the battle of Clontarf took place between the Irish high King Brian Boru and Máel Mórda mac Murchada the King of Leinster, this second force was mainly made up of Viking mercenaries under Sigtrygg. This battle was fought all day and ended in a rout of the Máel Mórda's forces, along with the death of Brian Boru, this meant the Vikings were now a weakened force but the Irish had lost a strong leader and so the quarrels that epitomised earlier Irish history now resurfaced. In battle the Irish were known to be quick moving and aggressive, armour was not common and only the very rich could afford it. Feats of arms were encouraged in the tribes and the strongest were often rewarded by the leaders of a tribe, the best were known as Curadh or Tribal champions and these men would stand at the front in battle and challenge the enemy to combat often mid battle. 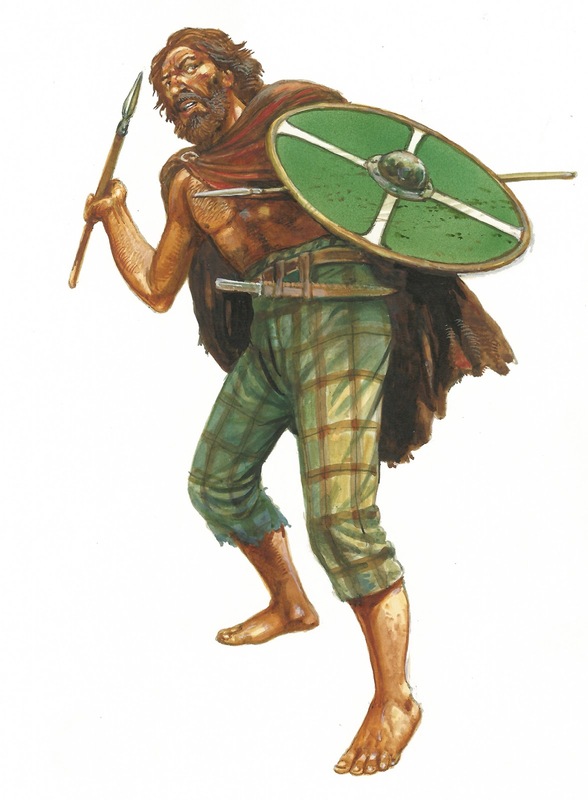 The Irish were also well known for using large wardogs to disrupt enemy shieldwall’s and bring down stragglers fleeing combat. In Saga the Irish faction gives a few interesting tweaks to other factions you may have seen before, firstly the lack of armour means Irish Hearthguard units are weaker against missile fire than normal, however they can be mounted so are more mobile in games. Secondly you can upgrade 2 Hearthguard figures and designate them as Curadh, these are units on their own and can be seen as mini warlords as they share many of the abilities that warlords use (full rules for them are given in the Ravens Shadow supplement). Thirdly the Irish can field a single unit of wardogs, this is a warrior unit of up to 8 figures which have superior movement to normal and can cross uneven ground without penalty, they have less armour then normal warriors but hey; they are dogs and will scare the bejesus out of your enemies. Other faction rules for the Irish will have to stay under wraps as we don’t want to spoil all the surprises for you. Sons of Dana is a great ability and will help to keep your opponents in open ground, basically any enemy unit that is either within S of uneven terrain or even inside uneven terrain takes a shooting attack with the attack dice worked out at half the figures in the unit being targeted, you don’t have to a unit in Line of Sight to the enemy it just happens. Maybe it’s some local kids, who are hiding in the undergrowth and are lobbing stones at the enemy, or maybe it’s something else, either way it’ll make your enemy think twice about hiding in terrain, the Welsh in particular will hate this ability. Another ability of interest for Irish players is Sidh, this is another terrain specific ability and means that in melee all enemy figures that are within uneven terrain have to take a test to see if they generate attack dice in the melee. This ability is a melee/reaction ability which is a new concept in Saga, full rules for using melee/reaction abilities are given in the rule book but in short they are abilities that are played before step 1 of a melee and can therefore change the amount of attack dice a unit generates at step 1. As always we have 2 Heroes of the Viking age for players to use in their games, for the Irish we went for 2 people who lived at the same time in fact they are brothers. Well that about wraps up my review of the Irish faction, in the playtesting we did for the supplement the Irish were my favourite faction to use and I love the way they play in the game, you have to think long and hard about the best way to use the Irish in your games but they will always give you a good game.